Allentown, PA - ATAS International, a manufacturer of commercial and residential metal roof, wall, and ceiling systems with production facilities in Pennsylvania, Arizona, and Tennessee, has installed an Ultra-Precision High-Speed Single-Loop Turret Head™ Slitting Line in its 100,000+ square foot flagship facility in Allentown, PA. 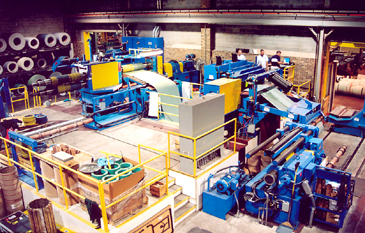 The new slitting line, manufactured by Braner/Loopco, Schiller Park, IL, is designed to process 15-ton x 61" wide surface-critical pre-painted aluminum, copper, galvanized steel, and zinc coils in gauges from .015" through .075" at slitting speeds to 1,000 FPM. 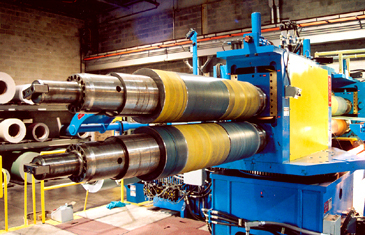 The slitting line handles 16" and 20" ID x 72" OD master coils and produces slit coils with 16" and 20" IDs with coil ODs to 72". Compact High Pass Line: The ATAS International slitting line employs the compact high pass line equipment arrangement, an improvement over older floor level slitting line technology. Compact high pass line slitters eliminate strip surface damage and offer faster coil threading, improved coil tracking, and improved slit coil side-wall registration, while occupying minimal floor space. The Uncoiler and Recoiler are installed at floor level, while the equipment between is elevated to match the largest coil OD. 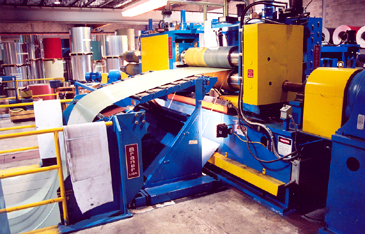 This concept eliminates reverse bending of the strip against the natural coil set, as the coil is processed. Because the strip is never reverse bent, strip threading is fast, and coil-breaks (generated from reverse strip bending) are eliminated. Product surface quality is improved from elimination of deflector/pass line roll induced surface scuffing and scratching; because high pass line deflector rolls are positioned below the strip, not above, they never touch the strip surface. Ultra-Precision Turret Head™ Slitter: The Turret Head™ Slitter is equipped with two (2) 8.000" quick-change ultra-precision slitter heads that allow ATAS to consistently produce close-tolerance light-gauge surface-critical slit coil with minimal slit edge burr. The unique Turret Head™ design features unobstructed approach to the slitter arbors, which makes tooling loading and unloading easy and fast. Re-tooled slitter heads are exchanged in less than 2-minutes. The Slitter is powered by a 125 HP-DC drive that allows full loop slitting of all gauges from .015" through .075". Pushbutton Tooling Lock-Up: The ATAS Turret Head™ Slitter is equipped with a feature that secures tooling onto the slitter arbors via pushbutton activated hydraulic actuated steel locking pads, rather than threaded lock nuts. The Pushbutton Tooling Lock-Up feature reduces re-tooling time by eliminating the time-consuming task of threading lock nuts onto the arbors and energizing via grease gun. Pushbutton Tooling Lock-Up eliminates thread maintenance, broken grease fittings, and messy grease guns, and improves productivity. Surface Inspection: A non-marking roller table installed at the exit side of the Turret Head™ Slitter permits efficient visual inspection of the strip surface after slitting. The Inspection Table serves as a scrap side-trim deflector when it is in the running position, and also serves as a slitter tooling inspection platform when the Table is withdrawn from the line during head changes.